The fact that everything is searchable online these days means that you have a responsibility to yourself and to your business to market yourself well via your website. After all, it's an expense in your business that is worth getting a return on, right? But it's all too easy to fall into the well of project overload, pushing things off until the weekend or that next period of free time (psst… it's not coming!) or when things are slow in your business. But what if that proverbial project well goes dry? You might start to think about your website and how you might tweak it to get more traction with potential customers. Ugh... but where to start?! So, instead of doing an entire website revamp or even making a few of those minor tweaks, you end up keeping your site the way it is. Months start to pass on the calendar and you haven't touched it, let alone thought about what you could do differently to attract more of your ideal clients. And while you might not be in for the entire revamp just yet, but if you're open to planning it for the future and/or tinkering around a bit on your website, here are five website mistakes translators and interpreters often make and how to fix them. These should get you off to a great start and help you brainstorm how your new and improved site should look and feel once you're ready to tackle it. For more ideas on how to make a real connection (or not!) with your site visitors, check out this infographic What Makes Someone Leave a Website. People want to know what it's like to work with you. So, give them that by engaging with them, creating a connection beyond the services you offer. The "About" section of your website should start by telling visitors who you are, mention some of the problem(s) they face, how you solve their problem(s) and the outcomes they can expect if they work with you. This is similar to an elevator speech, but it's in text form and should be concise without feeling stiff or cold. Here's an example of a great "About" introduction for a fictitious translator named Susan. We often fall into the habit of creating our site as we think it should feel or look without actually considering our ideal users. One way to change this habit is to have someone navigate the site in front of you. Start on the "Home" page and let them click around the site at their pace and as they desire. Don't tell them what to do or where to click next. Pay attention to what they choose and where they navigate, click after click. What changes can you make to improve their experience? Ask them follow-up questions about what they thought they'd find by clicking on certain items. The person (or persons--even better!) should be an ideal client, if possible. This will help you determine various details about how your site should look and feel, keeping the user experience in mind. Just like everything in business, markets shift. Ideal clients change. As time goes on, you see how what once worked well for you may not anymore when it comes to gaining new clients or reaching your ideal customers. As these shifts and changes take place, you too must adapt. This means your site should adapt to these changes as well. Pay attention to and keep track of the ways your ideal customers change and be ready to change with them. This is all part of doing business. From time to time, you will want to update the design and branding on your website to continue "speaking" to your ideal client in a way that makes them feel like you really get where they're coming from. No one wants to read a site that's all about you. Make your site stand out to your ideal client in a way that makes them feel like it was worth taking the time to read your content. They should feel like you know them already, like you created your business (and site) with them in mind. This is the true way to win over your ideal client's heart. For more ways to appeal to ideal clients, check out How to Determine and Attract Your Ideal Client. If you're making any of these mistakes, there's no reason to worry. Just fix them and move forward. Dust off that website and get to work. The key is to know your ideal client well and to write and design the site with them in mind. The rest will work itself out! Want to learn about more ways to leverage your website and online presence? 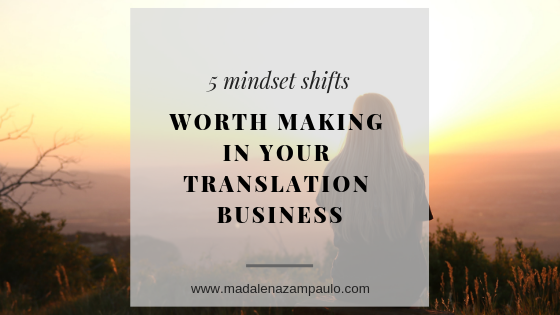 Click the button below to gain access my upcoming webinar How to Leverage Your Online Presence to Market Your Translation or Interpreting Business and accompanying workbook. The 90-minute webinar is chock full of actionable steps that you can take right away to boost your presence online, attract more of those ideal clients and avoid mistakes in online marketing of your translation or interpreting business.